Combine flour, oats, baking powder, sugar and pecans in a large bowl. Combine egg yolks, milk and vegetable oil in a separate bowl, and mix well. 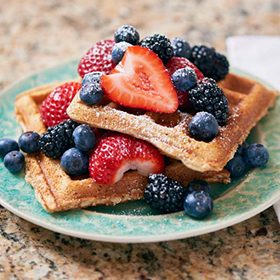 Add fresh fruit and a light dusting of powdered sugar to each waffle, and serve. *For pancakes, do not separate eggs. Mix whole eggs with milk and oil, and make pancakes as usual. Serving size: 3 small (2-inch) or 1 large (6-inch) waffle. Amount per serving: 340 calories, 11g total fat (2g saturated fat), 50g carbohydrates, 14g protein, 9g total fiber, 331mg sodium.